This is on my design wall today, all the fabrics are cut and ready to be pieced. 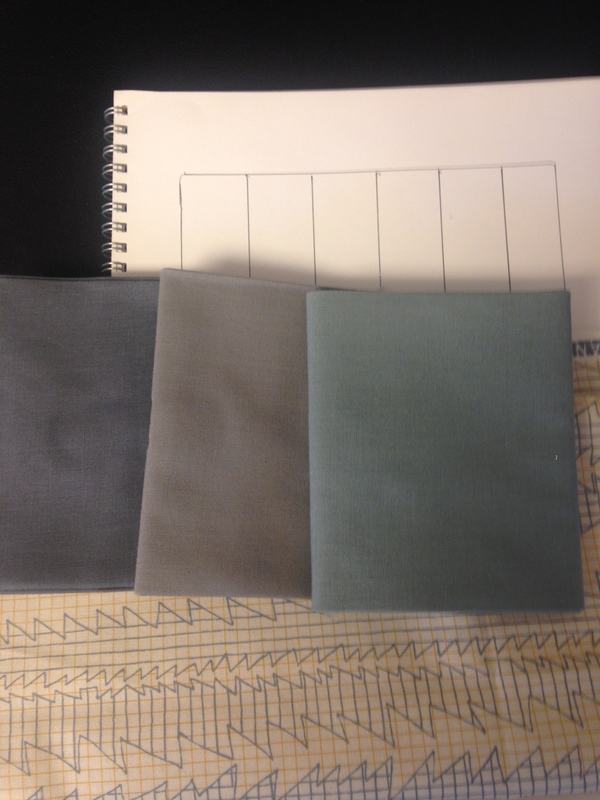 I am using grey tones in three values and a fabric that didn’t photograph well enough here called Doe , a Robert Kaufman line of fabric by Carolyn Freidlander.Here’s a better photo. 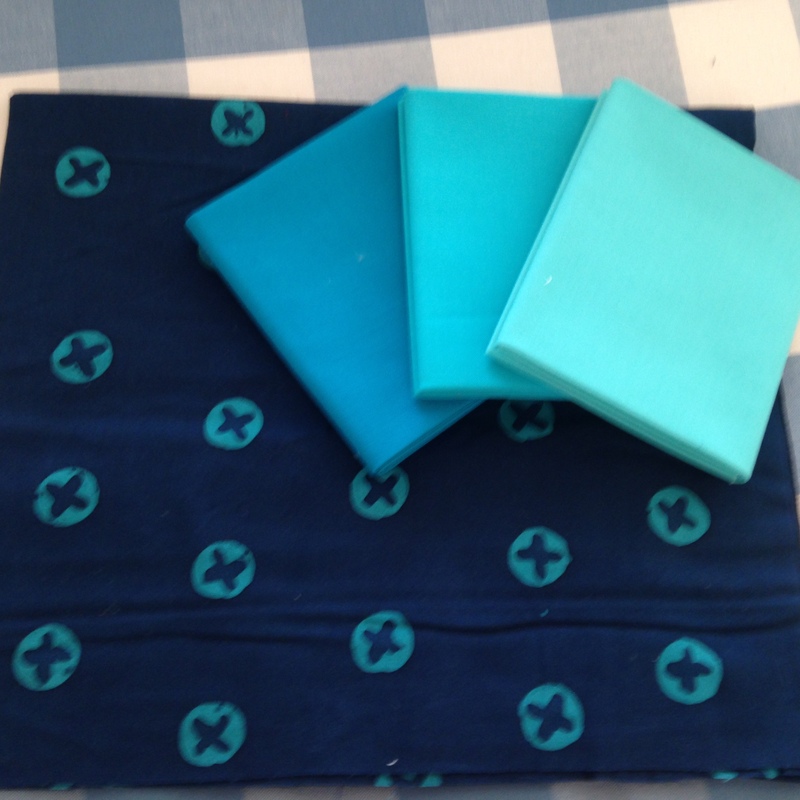 I am really into this fabric, I love the basics of it and that I can use my solids and my other fabrics and it all can work together.So, I still need to stitch these pieces together.I’ve cut strips at 1.5″,so it should be some mindless sewing time. I love mindless, repetitive work, it’s very relaxing to me. Also,I’m thinking about what’s next for this little baby, here’s the color group I’m going to use(I think). I chose a cool color group, but I’m still not sure what I’m going to do with them. One idea is a very labor intensive and complicated piecing using paper and drawing out some very spikey shapes with curves involved. I’m not sure if it would be right visually ,so I plan to test a little and work with my quilting software. Hope you’re all enjoying your day! 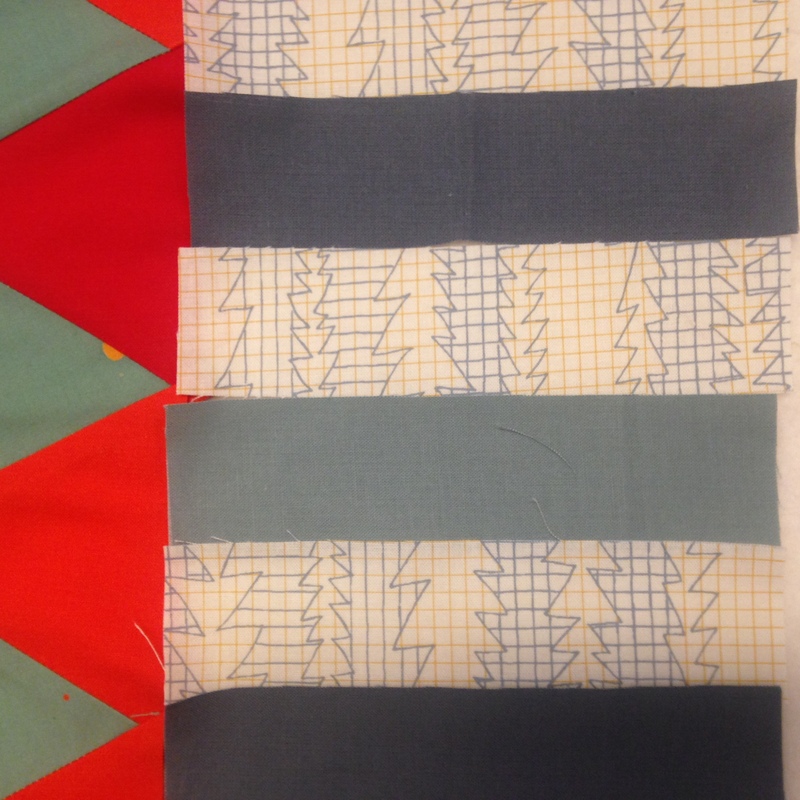 Today I worked on another layer of my quilt, as I was working I began to think about when I was a Freshman in art school and studying the German born American artist and educator Josef Albers.He was faculty of the Bauhaus in 1922. I always thought of him in regard to his color studies. Well, while working with solid fabrics and using them in a way that one might use a paint he came to mind. I will probably look back at his work at some point while working out this quilt. Tomorrow I am planning on subduing my colors to the above , I don’t want to pre plan too far ahead of myself, but I think this will be it. I’m excited, so far very pleased with how it’s pulling together. The fact that it may be 30 degrees below zero here with wind chill should keep me focused and inside! For those of you enjoying beautiful weather…enjoy, I’m jealous! I hope you all had happy times celebrating the holidays with family and friends, we did here! I have barely worked in my studio and have’t posted much lately. My plan is to be more diligent in at least spending some time getting re- into everything. 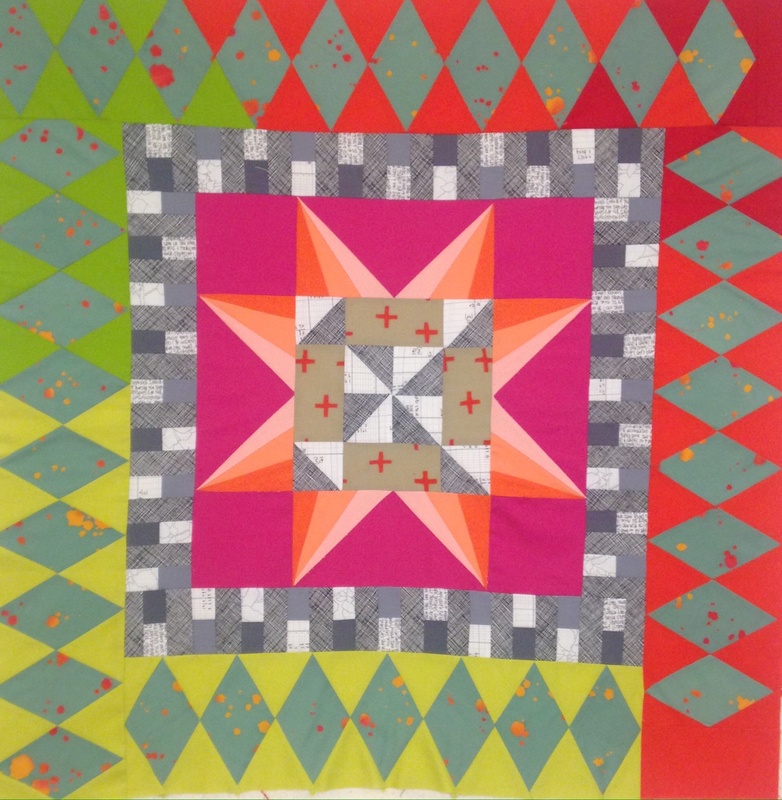 I still have my recent Shimmer quilt on my long arm waiting for me to continue with quilting . I still have my New Star quilt , above photo, awaiting it’s continuation. I feel good though about where I’m at with it thus far. Because it’s so bright and clear (star wise) I decided to go with grey and black and whites surrounding it as an inner border. I am so in love with the great quilting fabrics out there now. I am in love with Carolyn Freidlanders’ fabric called Doe, also am using her formerly recent lines Botanics. I also love Allison Glass’s fabrics and have some that will be used in the next border. 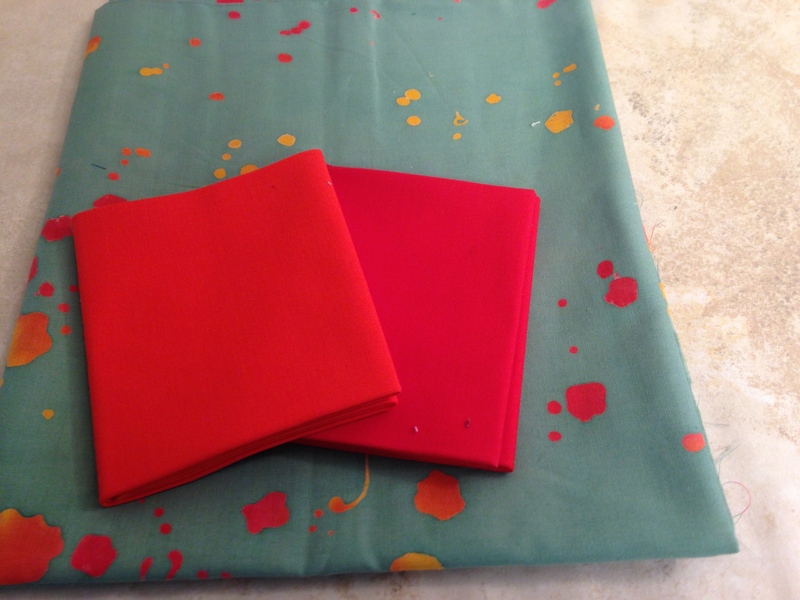 Aren’t these fabrics perfect together, pairing some Allison Glass with Kona cotton, the colors are so vibrant, what do you think?I’m planning to use geometric, simple shapes as my next border. Hope it works out, ya never know! So, I’m going to get to it now! I’m wishing you all a Happy, Healthy New Year! Hi everyone, I’ve been so busy lately that I have barely had a chance to get into my studio, so you can imagine how excited I was today to bury myself inside and get to work.I thought I’d share a couple of blocks that I’ve designed in my quilting software. 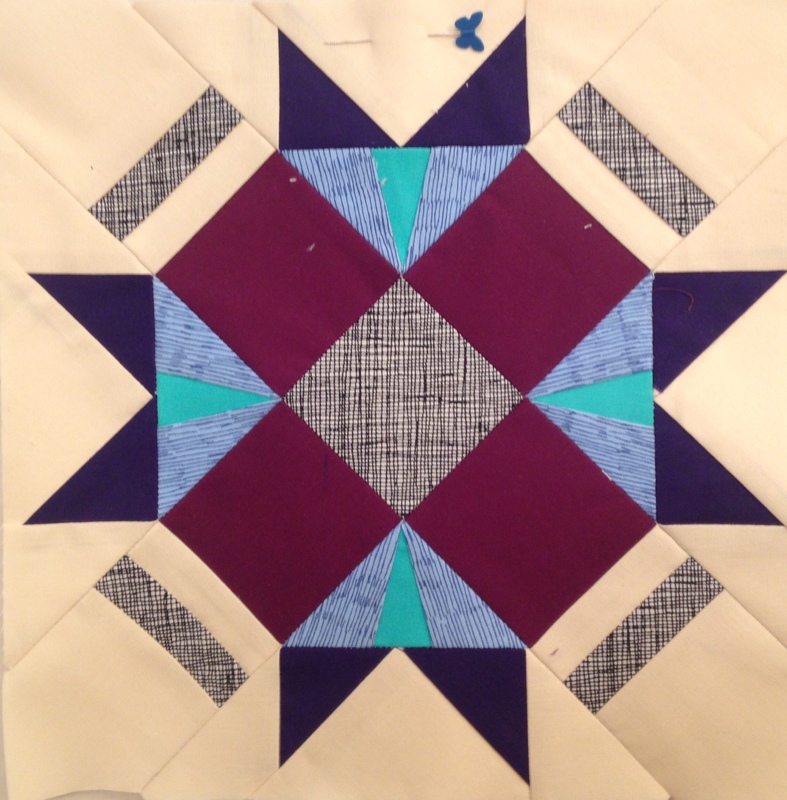 This star block that you see in the above photo is 18″ and was mainly pieced , but I used paper piecing for the star points. 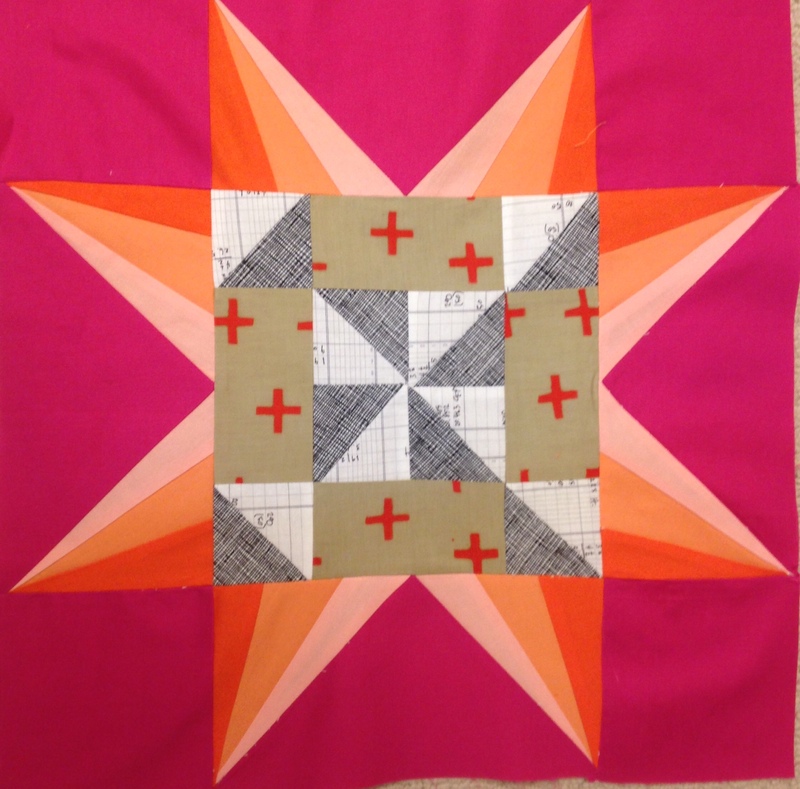 I’m pretty happy with this block and love the oranges and pinks together!I also plan to use the graphic fabrics by Carolyn Freidlander and Allison Glass to work with the bright solids I am planning on using. Here’s another block I will use, I designed this block as a paper pieced pattern and my plan is to tweak these colors and more likely continue with my bright color theme and graphic fabrics to compliment the brights. I still have a lot of things to work out, but all in all it was great just to give myself a little time today to work! I hope you are all enjoying the holidays! 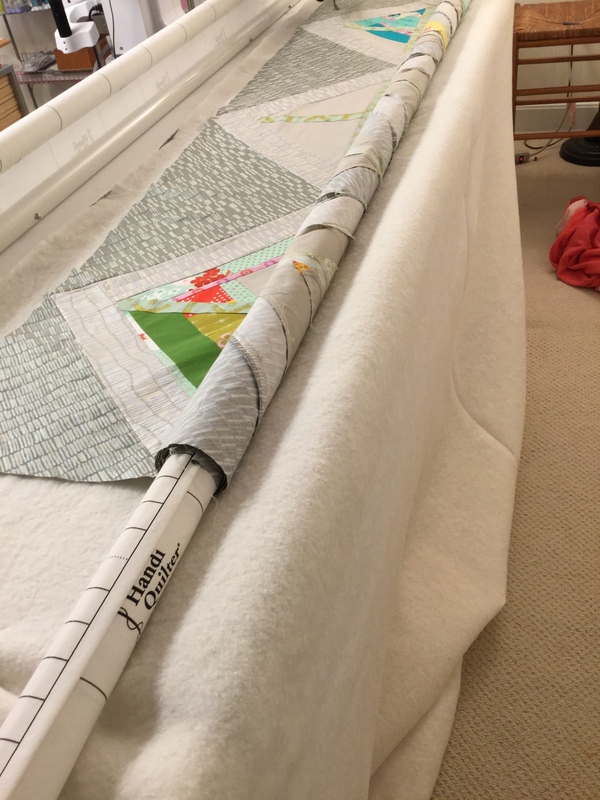 I’ve been in between quilting this quilt and working on blocks for my next one…so I figured I would post a few photos whilst I’m working away here. 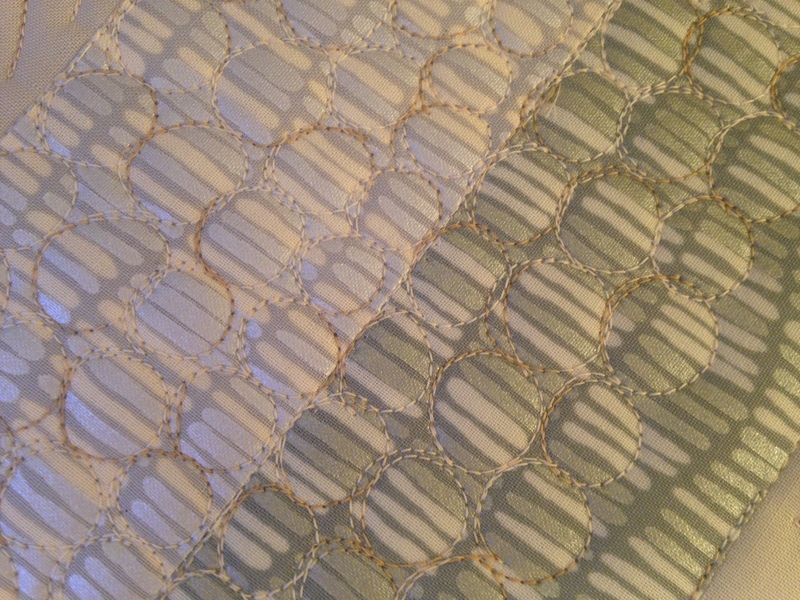 I am really enjoying this quilt because I love making pebbles(which are circular motifs that are used as fillers). 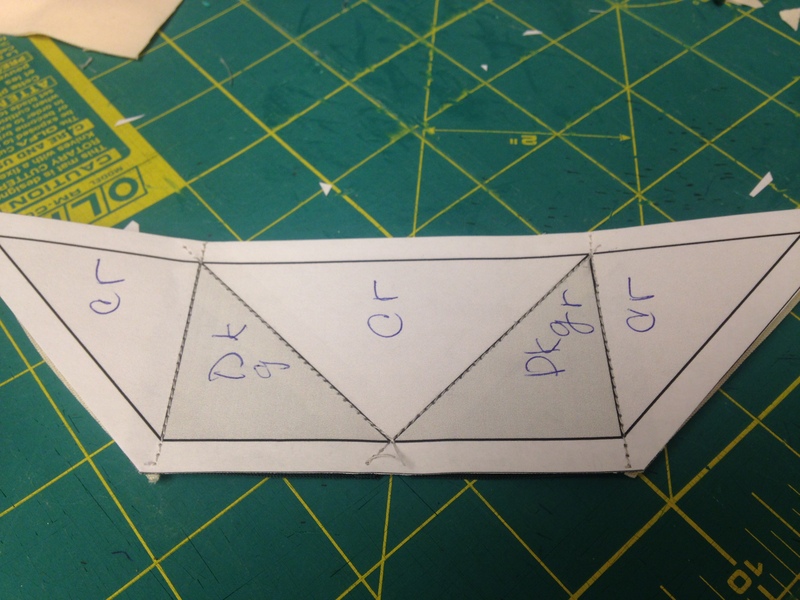 I also am trying to simplify areas where the piecing is a little busier by using a branch like pattern. 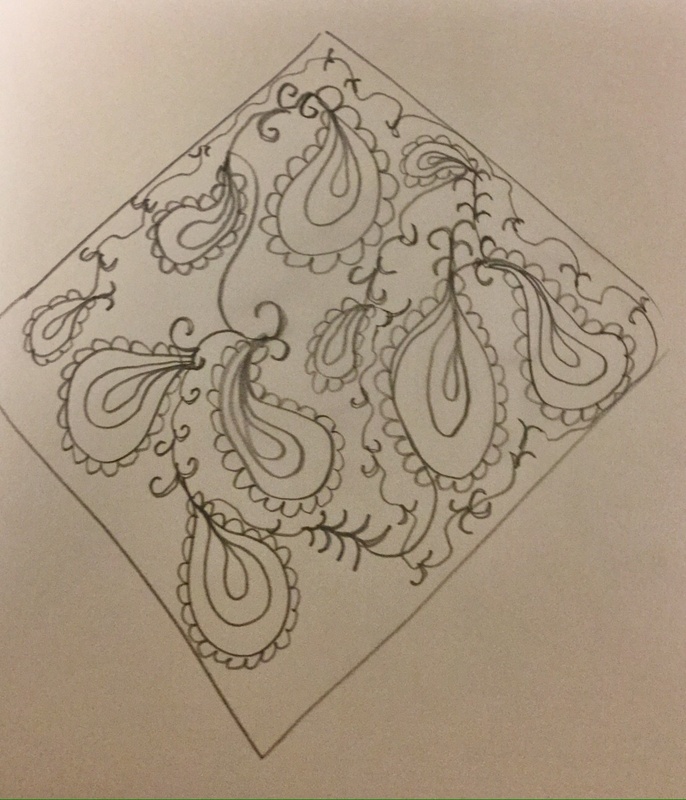 I’m using a paisley like design on the negative, open areas, which I have drawn free style and on one hand feel that they may not be showing up to their fullest glory because of the fabrics colors and my thread choice. But, hey what the heck,I wanted subtle , and so that’s what I’ve got! 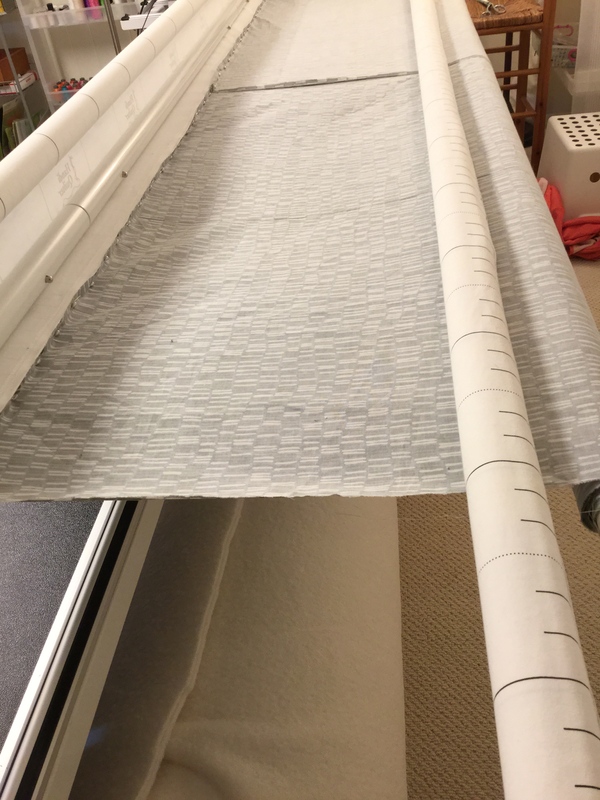 My favorite quilting thread from Superior Threads is a neutral variegated 40 weight.I really love the tiny passes that are a darker shade,then it goes to the lighter shades.So, I’m really counting on when it’s all done and off the longarm that these subtleties translate to shimmery and dimensional. I don’t know if I had mentioned that the batting is a Hobbs 80/20 and so when washed it won’t be as puckery as an all cotton batting. In case my photos are too subtle, here’s the drawing of my paisleys! Well, that’s where I’ll leave it for todays post!Hope you are all enjoying whatever you’re working on too! 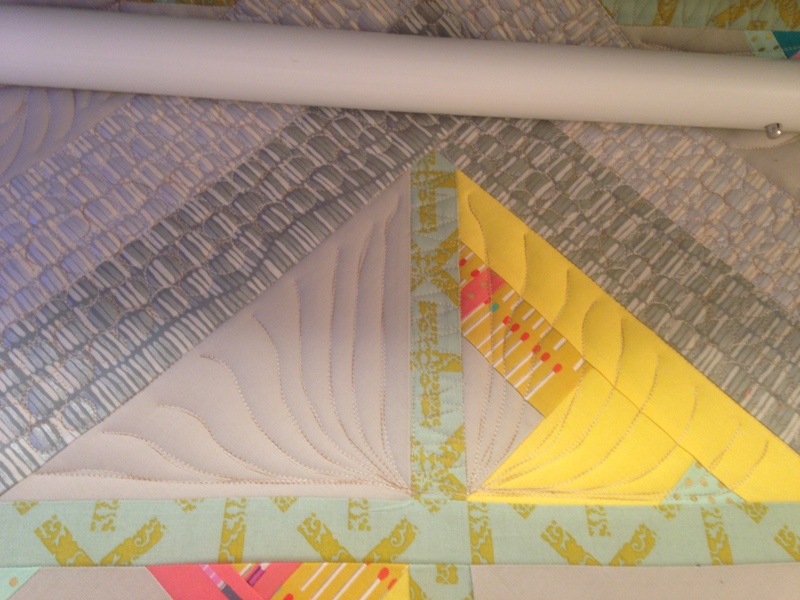 I have decided to work on a paper pieced project along side my quilting on the long arm. 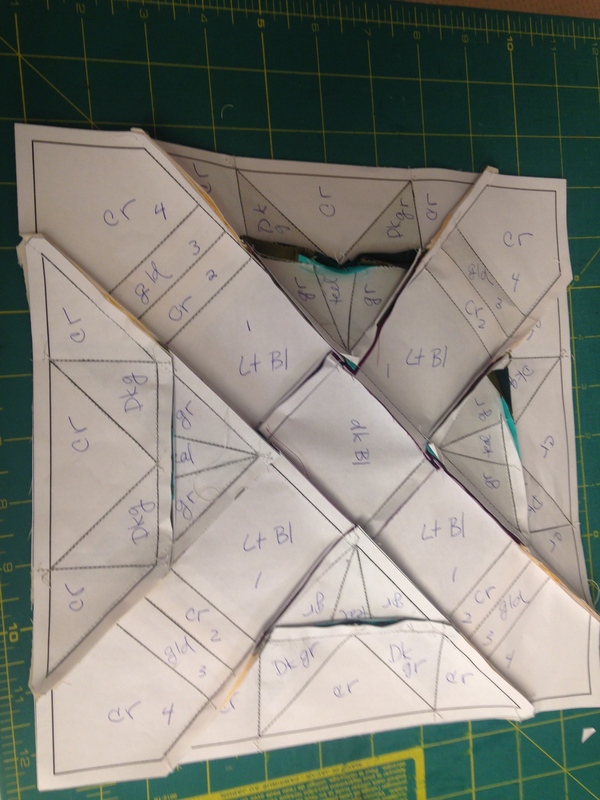 I need to change it out while doing more elaborate quilting , and paper piecing fits the bill. I really enjoy the preciseness and once I establish the colors, cutting and print out the papers for my piecing I find it to be quite relaxing! 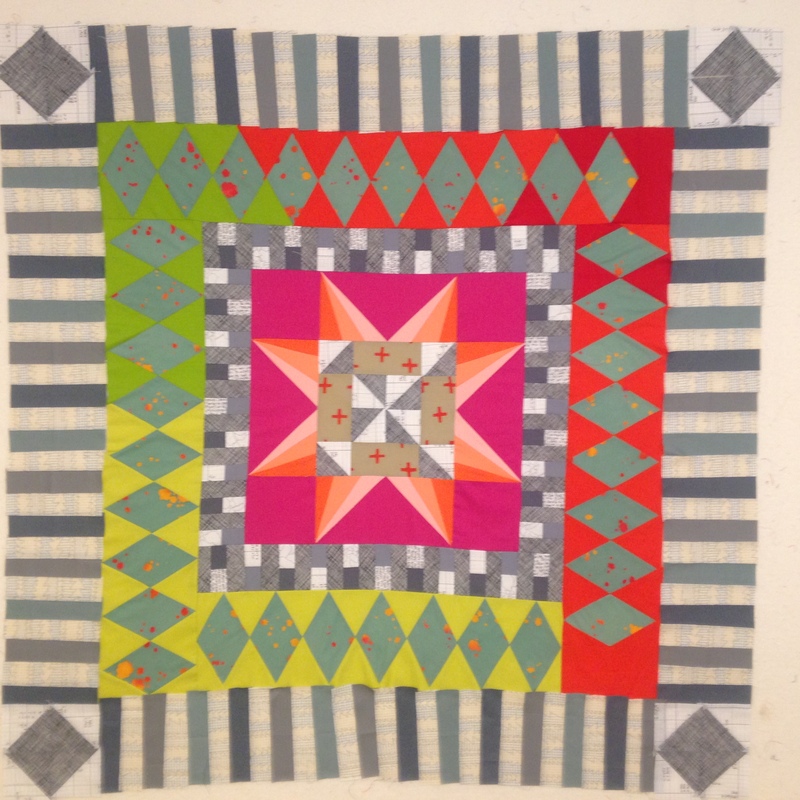 For any of you out there that may be new to quilting and or paper piecing it’s really fun. For the above block I used my Electric Quilt software to draft out this pattern and was also able to color it, though I changed out the colors to suit what I have on hand with my fabrics. 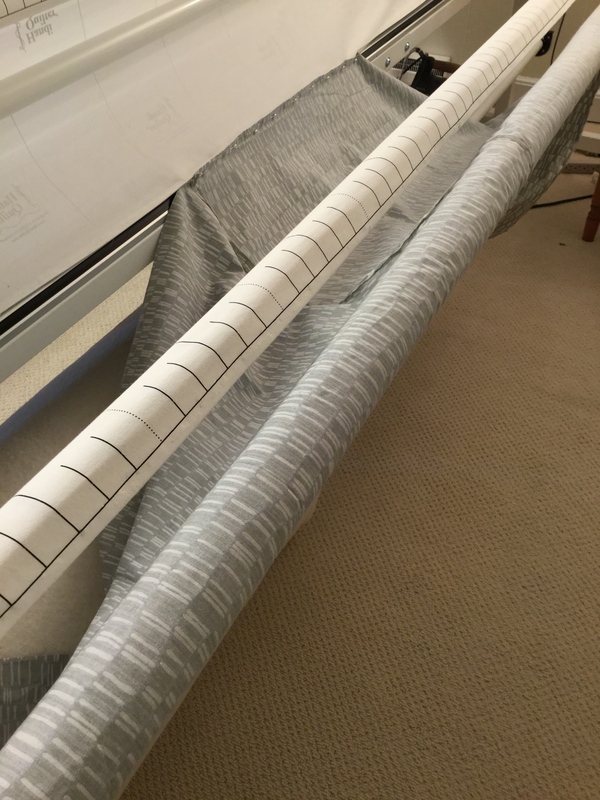 After printing out the pattern I like to measure the different parts and cut them a bit over sized, I know there is a bit of waste here with the fabric but it’s worth the precision. 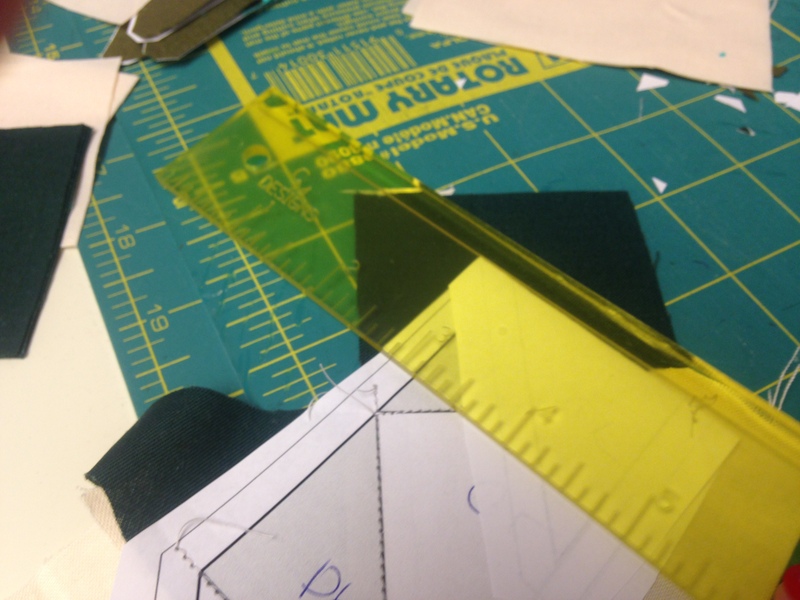 I use the ruler you see above called add a quarter, I will always trim to the quarter inch so that my seams are less bulky and lay flat. Also I feel it’s really helpful to notate the colors I’m planning to use for each block. 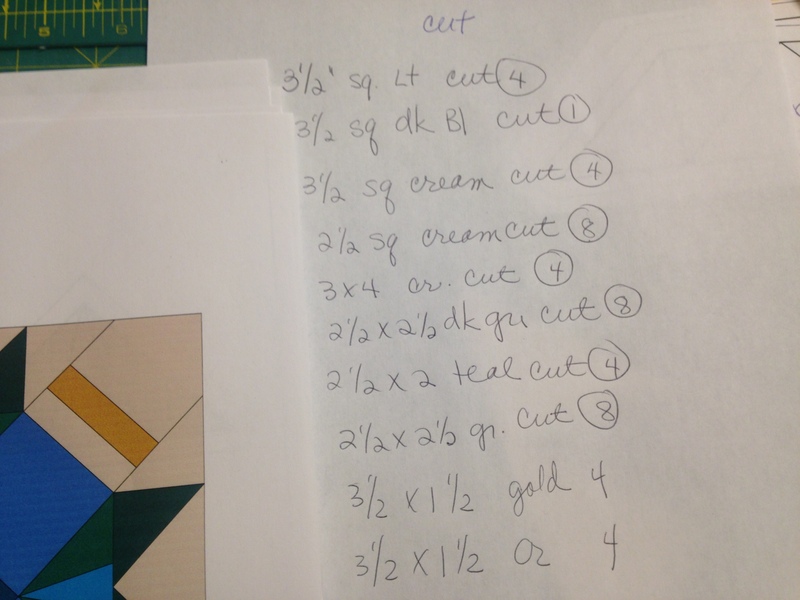 As you can see I’ve made a list of sizes to cut each element and from here I can cut all my shapes and get them organized for some fairly mindless sewing time. I think after the first block or two I can just zoom along and sew. This is the back pre pressing, after the joining of the seams I will give it a nice flat press before I take away the papers. 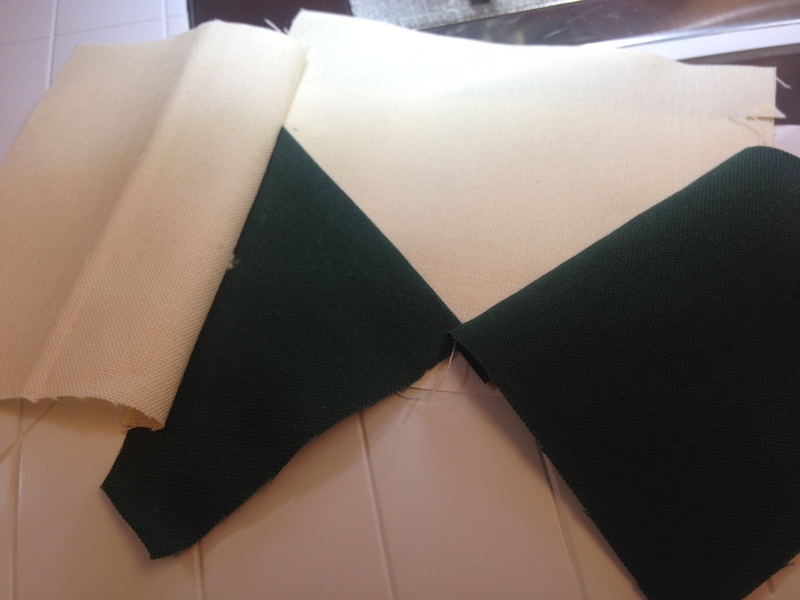 The paper really does stabilize the fabrics so there is absolutely no distortion. A perfect block every time. 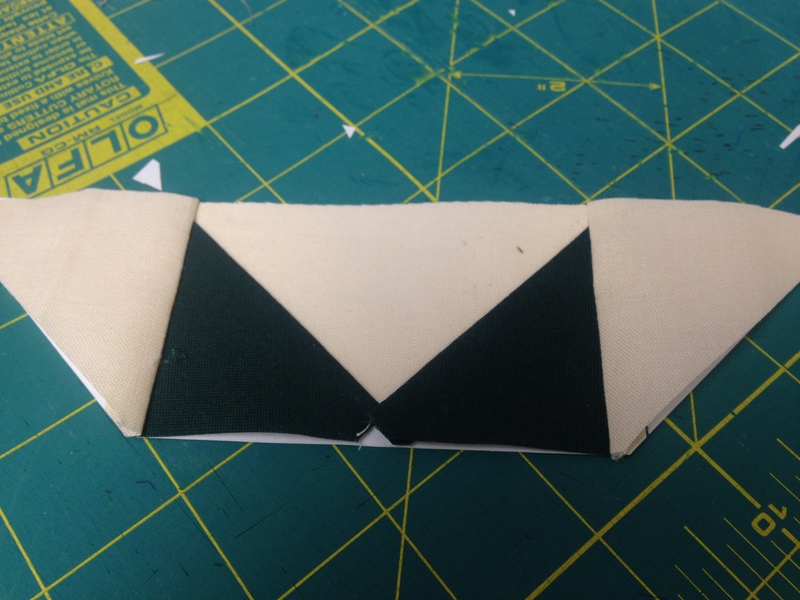 I hope you give paper piecing a try, and I’m sure lots of you are experts already. 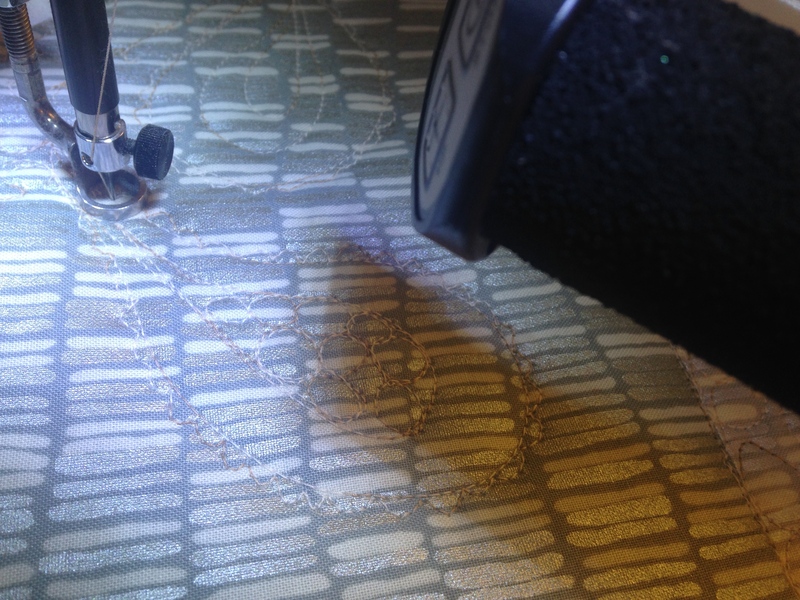 It happens to be a lot of quilters favorite method! 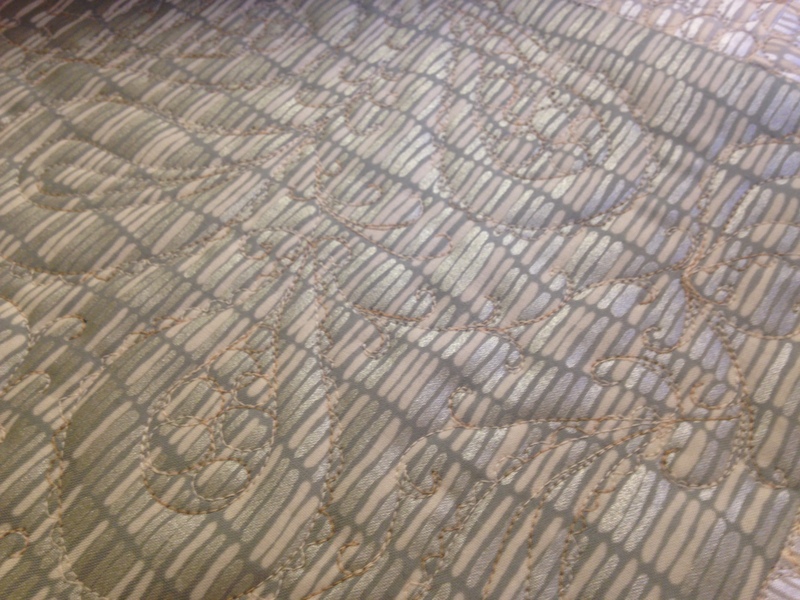 Hi everyone, my project today was to load my Shimmer quilt onto my long arm, and that I did! Yay! I thought I would show you some photos for those of you who may be thinking of buying a long arm, or are just curious. The first thing I do is to prepare the backing and quilt top. I like to find the centers of both the top and backing to keep things even with my leaders. The leaders are the canvas’s that you see above. 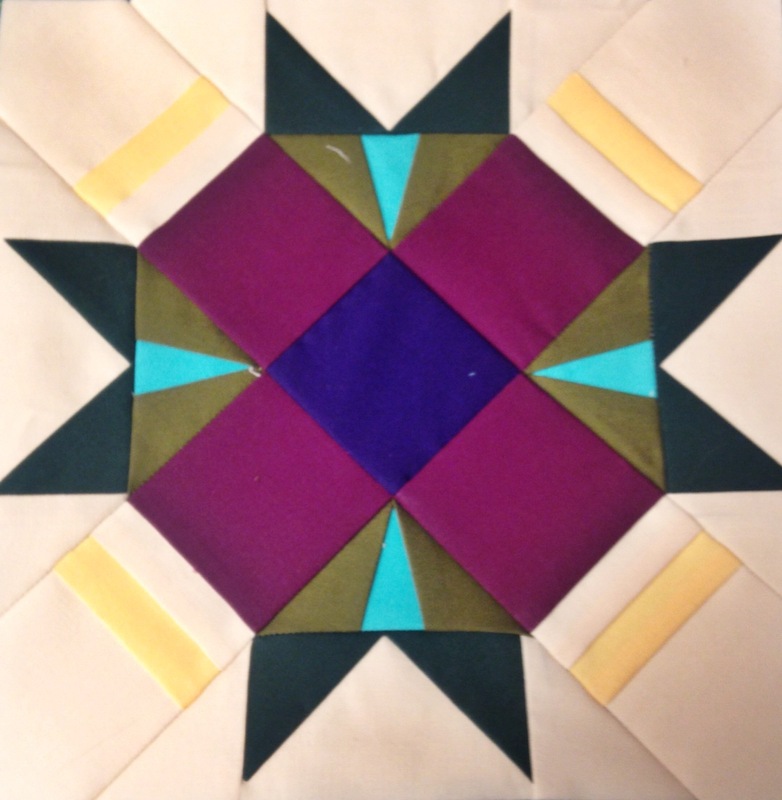 I have the center marked on my leaders and match them to the centers of the appropriate front and backing of the quilt. So, above you see me pinning the quilt back to the appropriate leader. Here you see the backing all neatly pinned and ready for the next stage which is the quilt top. Here you see that the top is nicely pinned and ready on the front leader and then I inserted the batting in between the two layers. 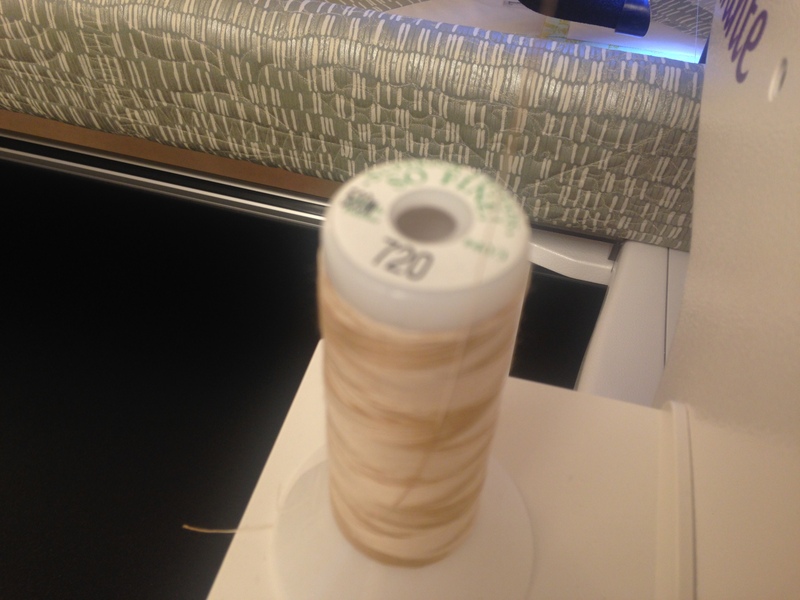 I’m using an 80/20 Hobbs batting,which I really like, it has a softer feeling and the quilting will really show well. Also, when I wash the quilt it won’t pucker as much as a cotton batting. I do love the look of the puckers though and all antique quilts that have puckers, but when I work so hard on custom quilting I don’t want to loose my details after washing.So, 80/20 Hobbs it is for this quilt. 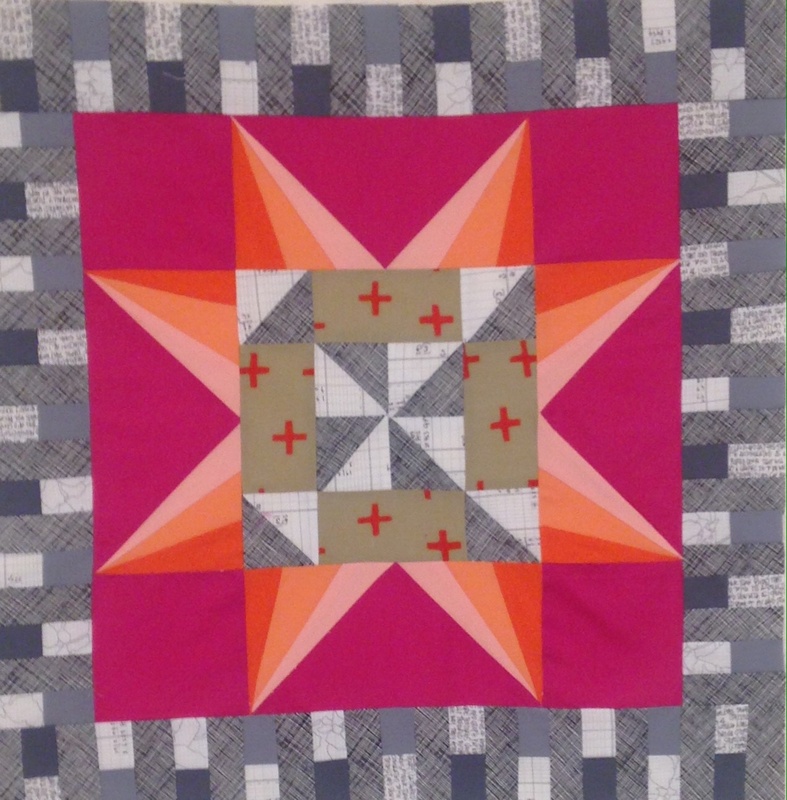 Hope you all are happily quilting!